One of our Sr. PMP Instructors had to say this: The PMBOK Guide, 6th Edition was released on September 6th, 2017. 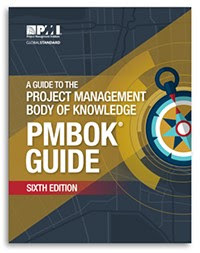 Since I am an active PMI member, I was able to download the PDF version of the PMBOK guide for free the day it was released. 2. The Agile Practice Guide. The first 800 + pages were the PMBOK Guide, and the next 180 are the Agile Practice Guide. Appendix X1 of the PMBOK Guide, 6th Edition provides a complete list of changes to the Sixth Edition. This post is a summary of changes and my analysis of those changes. Since I’m yet to complete studying the guide, I may update this post after learning more. The 6th Edition of the PMBOK Guide aligns the guide with PMI’s RDS (Role Delineation Study) of 2015. The PMP exam was updated in January 2016 to align with the RDS findings, but the PMBOK Guide was not. This 6th Edition of the PMBOK Guide is now catching up on that. The 6th Edition aims to make the guide more consistent and provide better clarity on the project management processes on their inputs, tools, techniques and outputs. The guide also ensures compliance with other PMI fundamental standards. There are several significant updates in the 6th Edition. PMI acknowledges that in recent years there has been more adoption of agile and adaptive methodologies in the management of projects. Therefore, there is greater focus on Agile/Adaptive methodologies in the 6th Edition. Let’s look at the many changes to the structure of the guide. Chapter-1: The Introduction, Chapter-3: Project Management Processes and Annex A1 of the 5th Edition have now been consolidated into Part 2 (The Standard for Project Management) of the 6th Edition. The Role of the Project Manager, which was part of Chapter 1 in the 5th Edition is now a separate chapter (Chapter 3) in itself. It ties the project manager’s skills to the PMI’s Talent Triangle. Expect greater weightage on this area in the next update of the PMP exam. 1. Project Time Management has changed to Project Schedule Management. It took a few decades for PMI to realize that project managers do not manage “time”, but rather define and manage the project “schedule”. 2. Project Human Resource Management has changed to Project Resource Management. Both team resources and physical resources are addressed in the 6th Edition, and hence the name change. Ø Five processes have been either added or moved to a different Knowledge Area or entirely removed from the 6th edition. 1. Manage Project Knowledge (Section 4.4) - Added. ü This was added to address the need for knowledge management in projects. Due to the distributed and mobile nature of the modern workforce, there’s more focus on knowledge management and information management, so that knowledge and information does not get lost. ü A key output of this process is the lessons learned register. This aligns with the “lessons learned management” task that was introduced in Jan 2016 update of the PMP exam. ü PMI emphasizes the need to learn continually throughout the project rather than waiting until the end to reflect. ü Since the Knowledge Area Project Human Resource Management has been repurposed as Project Resource Management (taking both human and physical resources into its folds), the Estimate Activity Resources process has been moved to the Project Resource Management. ü In the Fifth Edition, Project Human Resource Management had no “Monitoring and Controlling” process. That was indeed puzzling. With the 6th Edition, the Control Resources process has been added under the Monitoring and Controlling Process Group. ü Implementing Risk Responses was previously considered part of Monitor and Control Project Risk Process. But now it has been separated into a separate process under the Executing Process Group. This change makes sense to me. ü According to market research done by PMI, contracts are usually closed by contracts, procurement or legal departments, and not by project managers. Therefore, information from Close Procurements about evaluating all completed deliverables and comparing them to the contract was moved into Control Procurements. Information about administrative, communications, and records was moved to Close Project or Phase. Total processes have increased from 47 in the 5th Edition to 49 in the 6th Edition. Ø There is good news and bad news here. ü The good news is that the Guide is more consistent than the previous editions and does a much better job of explaining “why” an input or a tool or technique is used in a process. This had been a problem area with the previous editions. ü The bad news is that PMI claims that the number of tools and techniques have been reduced. But contrary to that, my analysis tells me that the number has increased from 118 to 131 unique tools and techniques (11% increase). The overall number of ITTOs has increased from 618 to 722 (17% increase) and that is despite the grouping mentioned above. If you count the leaf nodes (without grouping), the total ITTOs may touch 4 figures. The changes to the 6th Edition of the PMBOK Guide are quite significant. There’s greater focus on Agile and adaptive methodologies, benefits management and knowledge management. All these changes are aligned with the recommendations of RDS 2015 and some have already been incorporated into the PMP exam since Jan 2016. Overall the guide is indeed more consistent, detailed and clear compared to the previous editions. PMI has announced that PMP Exam will change on March 26, 2018 to align with the PMBOK Guide, 6th Edition. If you are preparing for the PMP Exam, you’ll be better off taking the current version of the exam to avoid any surprises from the update.